If you went back far enough on my pasty, pale, Anglo-Saxon family tree, like, thousands of years, you would undoubtedly uncover a Druid or two among my ancestors. I've often wondered about their mysterious culture, their pagan celebrations, and their early knowledge of astronomy. 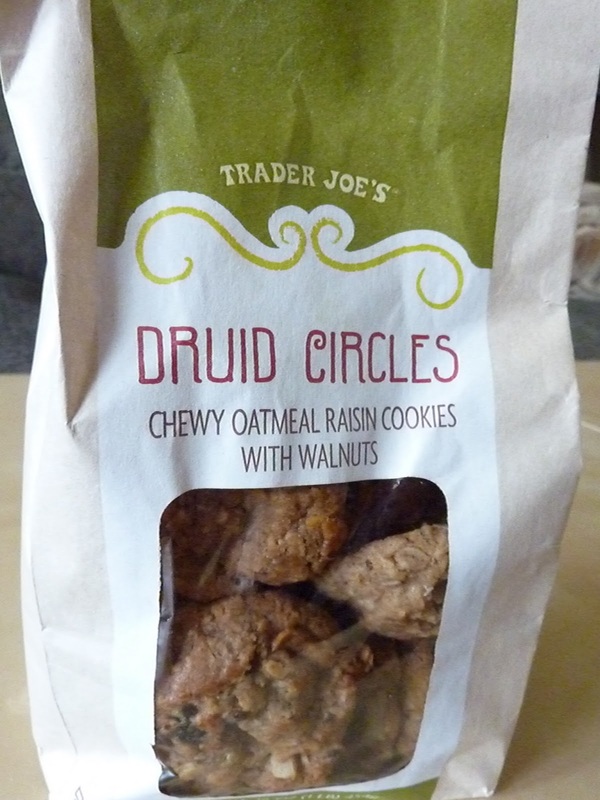 Apparently they kicked it oldschool, pranced around Stonehenge gaily, burned wicker effigies, and sacrificed their brethren to Celtic gods, all the while snacking on tasty oatmeal cookies. While I shall refrain from most of the former activities, I shall happily engage in the latter, because these are some of the best pre-packaged oatmeal cookies I've ever had. They're very moist, they're full of raisins and walnuts, and they fill my mouth with joy. The cookies actually taste like brown sugar, yet the flavors of the grains come through as well. They come in a little bag similar to that of the Sutter's Formula Cookies, and it's got tape that allows you to reseal it repeatedly, although toward the end of the bag, the stickiness kinda wears off. The cookies taste surprisingly fresh. And not only is the cookie dough part soft and moist, but the raisins themselves taste and feel like they're straight out of a Sunmaid box. 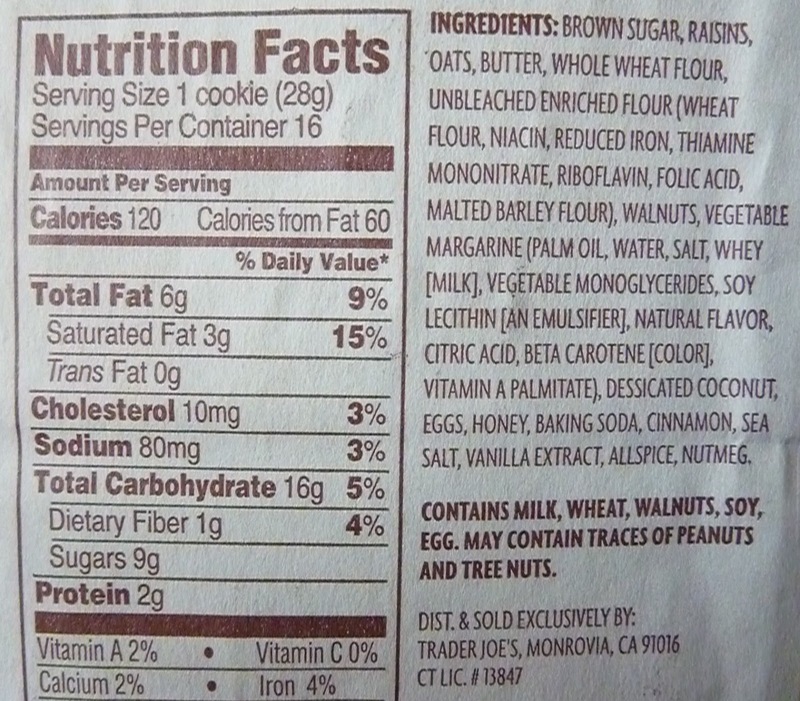 They've got a nice little chunk of your daily fat and saturated fat, especially considering a "serving size" is one cookie. One cookie? This is the part of the blog post where TJ's makes me feel like I have some kind of revolting overeating habit because I had three cookies with my meal—and 45% of my RDA for saturated fat. Oh well, there's always a catch. Cookies this good can't be good for you. 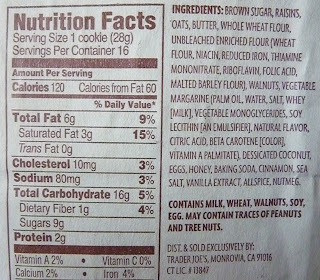 They might have gotten double 5's had we not looked at the nutrition information. As it stands, Sonia and I will each give them 4 stars. Yum, I'll pick some up next time I'm out. I know i'm late, but i just picked these cookies up today and they are still timelessly fantastic. They were so good that i had to look up if others felt the same. The. Best. Cookie.